Green Momster: There's an app for that! Beat the Microbead app: Sometimes I'm wandering through the cosmetics section of a store, hoping for a miracle, and I wonder, "does this product have microbeads in it?" This app allows you to find out pretty easily -- all you have to do is scan the barcode of the product to find out if it has microbeads. Unfortunately, many of the products I've scanned are not yet in the database, but the app also provides the terms to look for when trying to avoid microbeads. iNaturalist app: This helpful app puts field guides at your fingertips, allows you to log your recent sightings, lets you share information with fellow greenmomsters, and more! Seafood Watch app: I love this app! It's "your guide to sustainable seafood"! You can take a quick glance at your phone while you're standing at the fish counter, and quickly determine what's a sustainable purchase! It even allows you to search for Seafood Watch partners in your local area. Looking for sustainable seafood? There's an app for that! Sustainable Palm Oil Shopping App: Another of my favorite apps while shopping! This tool allows you to search the products you're thinking about buying to determine their Sustainable Palm Oil Rating -- so helpful! Products are grouped by food and drink, snacks, breakfast, pet, etc. National Geographic National Parks App: Planning to visit a national park in the near future? Then this app might come in handy. It includes basic park information, maps, and camping and lodging info for 27 of the most popular national parks. Not really any info that you couldn't get online, but it's nice to be able to access quickly through your phone. 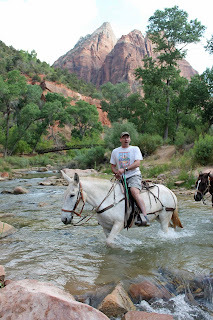 Visiting Zion NP? There's an app for that! Ducks Unlimited App: This app provides info on waterfowl migrations, allows you to keep your own birding journal, and provides a site for posting photos. But the most valuable tool for me is the bird ID. On this app, you can identify and learn about various waterfowl using pictures and audio. Have you found any helpful apps? Please share! Be sure to "like" greenmomster on Facebook and follow us on Twitter!